Oh thank goodness it's Friday! This week was better than last, so that's something. But, I love this Teddy quote and always love From Scratch. It's a concept I've been trying to put into action the last few weeks. There's a lot to accomplish, with limited time and resources, but it really all comes down to doing what you can with what you have and starting now. It's becoming my mantra these days. 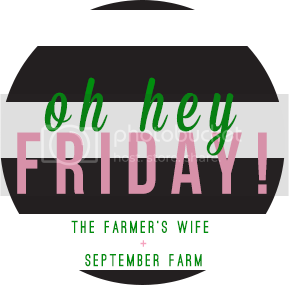 Joining in with Karli at September Farm again for this week's linkup. 1. It snowed this week. The second week of September. So as much as I'm excited for some fall weather, I'm not ready for winter just yet. I wore a summery dress on Monday. On Tuesday it got cold and on Wednesday it snowed. I love scarves and boots and crisp mornings as much as anybody, but I need just a bit more warm weather before we return to the frozen tundra. Hopefully my tomatoes survive. 2. Mice are back in the cars and between the floors. Probably because the temperatures dropped. We're trying all kinds of things to get rid of them. Other than a cat. We're going to need a barn cat. 3. I had a big interview with a top-level military commander, spent the morning of 9/11 with airmen and firefighters and wrote this for our weekly staff editorial that ran today. 4. Still putting the final touches on the new rink website, but it's just about ready to launch. I'm feeling pretty good about getting all of that knocked out. 5. Booking a flight back to D.C. for a military reporting conference in a few weeks. It will be great to get out of town for a few days, even if it's work related, and get back to one of my favorite cities in the world and see some old friends.